Combining a high-spirited history of country music's roots with vivid portraits of its principal performers, Don't Get Above Your Raisin' examines the close relationship between "America's Truest Music" and the working-class culture that has constituted its principal source, nurtured its development and provided its most dedicated supporters. 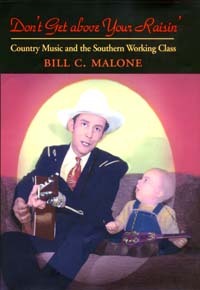 Widely recognized as country music's rankikng senior authority, Bill C. Malone explores how the music's defining themes (home and family, religion, rambling, frolic, humor, and politics) have emerged out of the particularities of working people's day-to-day lives. He traces the many contradictory voices and messages of a music that simulateneously extols the virtues of home and the joys of rambling, the assurances of the Christian life and the ecstasies of hedonism, the strength of working-class life and the material lure of middle-class aspirations. The resulting tensions, Malone argues, are a principal source of the music's enduring appeal. Country musicians have often been people from undistinguished blue-collar backgrounds who have tried to make their way as entertainers in a society that has little respect for the working class. From this ambivalent position, they have voiced the sometimes contradictory values and longings of their culture while also attempting to fulfill the romantic expectations of outsiders. "For every Garth Brooks," Malone says, "there are a thousand country musicians who perform in local bars, taverns, and American Legion halls and who have never been able to 'give up their day jobs.' These are musicians whose middle-class dreams are tempered by working-class realities." A powerful and hones expression of the hopes, longings, frailties, and failings of ordinary people, country music increasingly resonates with listeners beyond its core constituency as they struggle with a complex and uncertain world. Bill C. Malone, professor emeritus of history at Tulane University, is the author of Country Music, U.S.A.; Southern Music/American Music; Singing Cowboys and Musical Mountaineers: Southern Culture and the Roots of Country Music, and other books.